A country-comfy room at La Rignana, an agriturismo in Tuscany's Chianti region.The refined countryside retreat of Cosimo Gericke and Sveva Rocco di Torrepadula is set a long way from the main roads in the heart of Chianti wine country. There are two buildings for guests. The “fattoria”—a largely 18th-century structure, though its core dates back some 900 years—contains seven rooms of rustic furnishings, orthopedic beds, and sloping brick ceilings laced with beams. To enhance the getting-away-from-it-all countryside vibe, the rooms lack TVs, telephones, and A/C, but there is a common room with satellite TV, a modem hook-up, and a pietra serena fireplace. There are also eight plank-floored and frescoed rooms in the “villa” building, but those are available on a nightly basis only in April, May, September, and October. Otherwise, you have to rent either all four doubles on the ground floor, or all four upstairs, as a single apartment by the week (each floor contains a kitchen and a working fireplace). There is a horizon pool amidst the olive trees with views that seem to extend into the Arcadian Chianti beyond. The restaurant—in another cluster of farm buildings and under separate management—serves excellent classic Tuscan cooking on a patio with views over the vines that produced their table Chianti (tel. +39-055-852-601 or +39-055-856-0200; www.lacantinettadirignana.it). 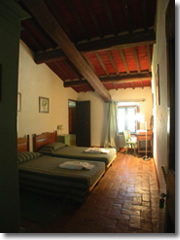 The villa is open year-round; the fattoria only from late March to mid-November.